On October 5th, Shinichi Kitaoka presented a special lecture on “Japan’s modernization and Fukuzawa Yukichi” at the MLIC Hall. 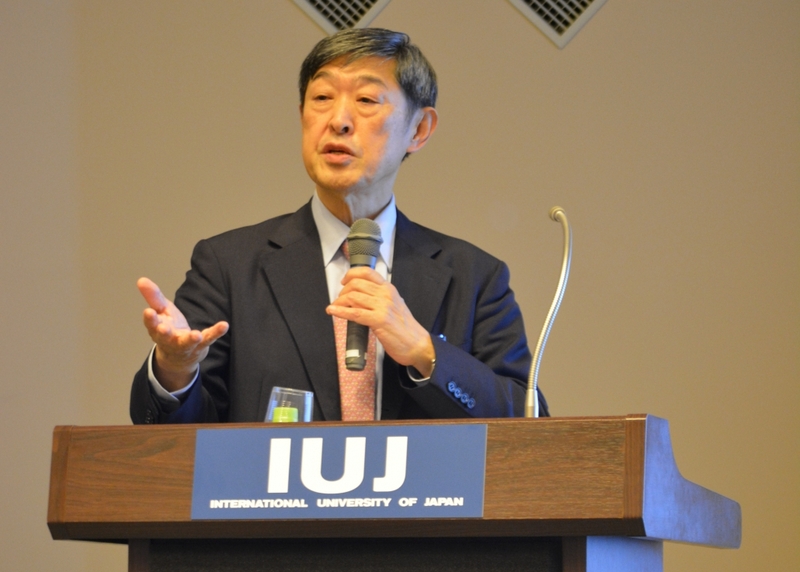 Kitaoka is the current president of JICA, and a former professor and president of IUJ. The lecture was part of the new Japan Development Program operated jointly by IUJ and JICA, but was open to any interested students. The lecture gave an overview of Japan’s modernization after the Meiji Restoration, from the perspective of political and diplomatic history. Kitaoka described the transition from the feudal systems of the Edo period (1603-1868) to the modern political institutions and industrial state of the Meiji era. He highlighted the influence of renowned Japanese scholar and statesman Fukuzawa Yukichi during this era of modernization. Kitaoka offered insight into both the positive and negative aspects of industrialization that served as the foundation of the future Japanese empire. The lecture led to a lively question and answer session. President Kitaoka’s meaningful presentation kicked off the Japan Development Program’s guest lecture series while strengthening the bonds between JICA and IUJ. To learn more about IUJ – JICA Alliance for Development Studies and our Japanese Development Program, please see the following link.